While guiding us through the marketplace in Harar, Ethiopia’s coffee capital, our tour guide Yohannes pointed to a tarp covered with tan-colored coffee beans, laying out in the sun. 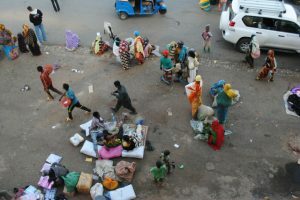 He smiled and bent down to pick up a handful of beans, saying something in Amharic to the woman sitting next to the tarp. “She’s drying them right now. Next, she will roast them into coffee,” he explained before handing us a couple to inspect. I thanked her and we moved on through the crowded market, talking more about how since Kaldi’s accidental discovery, coffee has revolutionized Ethiopian life. Yohannes explained it has become not just a major export, but an important aspect of Ethiopian life and culture. “Almost half of all coffee grown in Ethiopia is drunk by Ethiopians,” he said. Clearly, my friend and I had made the right choice to travel to Ethiopia for its coffee. Not that we hadn’t already been immersing ourselves in local coffee culture. 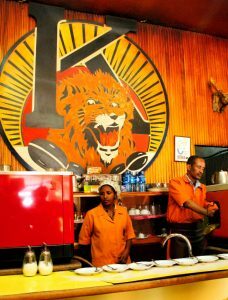 When we arrived in Addis Ababa one week before, we quickly discovered a smattering of cafes and coffee shops throughout Ethiopia’s sprawling capital. We passed everything from roadside stalls to posh, Italian-style cafes with glass tables, and even a Starbucks lookalike called “Kaldi’s”, named for — you guessed it — the apocryphal herder who first discovered coffee. As expected, each place featured aromatic, fruity, and full-bodied roasts from Harar, Sidamo, or Yirgacheffe — the main coffee growing regions in Ethiopia — served in tiny glass cups. However, the real star was Tomoca, the oldest coffee roaster in Addis. Entering their original downtown location, the scent of coffee roasting mixed with the sound of clattering espresso machines and loud conversations. A total whirlwind of sensory experiences, this coffee shop was everything the American cafes I’d last tasted Ethiopian coffee at were not. After ordering a macchiato, a shot of espresso with milk, and a buna (more or less a shot of espresso) for my friend, we sipped our tiny cups of robust, full flavored Tomoca house roast while standing — Italian style — at a tall table. We both agreed hands down that Tomoca had the best coffee we’d tried thus far. But however delicious that cup was, we had yet to get to the heart of coffee production and culture in Ethiopia. We had yet to set foot in Harar, Sidamo, or Yirgacheffe regions, where the majority of the country’s beans are grown. More significantly, Addis was fantastic for stumbling upon stylish coffee shops, but not so much for experiencing a classic Ethiopian coffee ceremony. So we headed to the walled city of Harar, in the arid, camel-dotted north of the country — not generally what you’d expect of one of the world’s leading coffee growing regions. 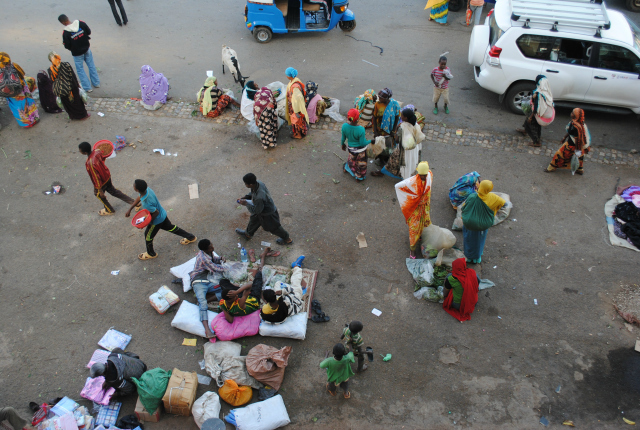 Nonetheless, Harar is, and has been, an important trade center for coffee. Throughout the city, women like the one we met with Yohannes were laying out beans to dry in the sun or roasting them over charcoal fires. Even as a passing observer, the importance of coffee was clear. 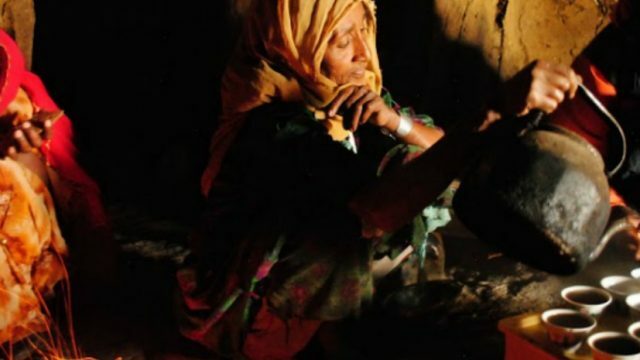 The coffee ceremony is a ritual that embodies coffee’s importance in Ethiopia, but one that can’t be bought like a Tomoca buna. After a bus ride into Harar’s surrounding countryside, we arrived at a small thatched hut with a dark and earthy interior — Yohannes’ aunt’s home. It smelled of incense, earth, and of course, the sweet aroma of his aunt roasting coffee in a pan over an open charcoal fire. She patted on bundles of hay placed next to the fire, signaling for us to sit down. After a few minutes, she removed the beans and began to pound them with a mortar and pestle before finally making the coffee in a tall, Aladdin-esque coffee pot known as a jebna. “She says this first cup of coffee will be very strong — do you want sugar?” he said, handing us a tray with thimble sized cups of coffee, one for each of the three of us, for us to slurp down as his aunt fanned the flame. We drank our cups, and returned them back to the tray. Again, she boiled water with the coffee beans in her coffee pot, and poured the coffee into our cups. Cup two. And a third time, she repeated the ritual, pouring a watered down version of the first cup of coffee into our cups. Cup three. By this point we were as jittery as the first goats who discovered coffee, but also satisfied that this ritual had forced us, in a way, to enjoy coffee with patience and deliberance. 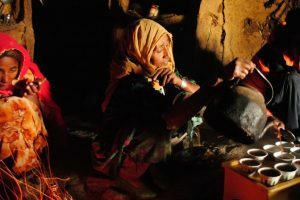 In the weeks we spent in Ethiopia, we had succeeded in sampling some of the best coffee on earth, but also an unexpected cultural connection to coffee. In the West, coffee serves as the drink to fuel and caffeinate our days, but in Ethiopia, it’s the vehicle that lets people pause. Although we, naturally, packed in our suitcases as many bags of beans as we could, at least that ritual was something we could only carry home in our hearts. Tomoca – Tomoca’s the oldest roaster in town and great place to buy whole beans. Kaldi’s Coffee – With multiple locations in Addis, this “Starbucks” imitator is just as popular. Yeshi Buna – This restaurant chain, started from a coffee roaster, serves coffee and traditional Ethiopian food. Lime Tree – This hip vegetarian spot not only brews a mean cup o’ joe, but some tasty breakfast and lunch as well. Wude Coffee – A high-class Ethiopian joint with top notch coffee in a pleasant outdoor garden. Ezana Cafe – Stop here for breakfast and a buna before a full day touring Aksum.